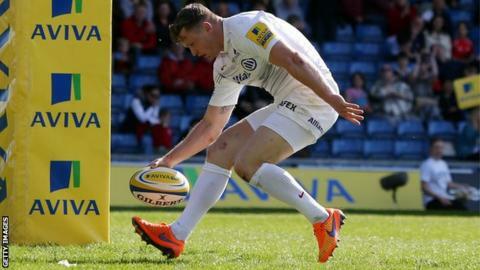 Winger Chris Ashton scored four tries as Saracens thrashed London Welsh to secure a Premiership play-off place. The Exiles were nine points behind at half-time after tries from Nick Reynolds and Chris Elder, but conceded 42 unanswered points after the break. David Strettle, Alex Goode, Juan Figallo, Charlie Hodgson and brothers Billy and Mako Vunipola all crossed. The 10-try victory means that Saracens will face an away trip to league leaders Northampton in the semi-final. The thumping victory saw Saracens leapfrog Exeter Chiefs to finish in fourth place by virtue of a 20 better points difference. Welsh lost Matt Corker to the sin-bin after just four minutes and the visitors capitalised immediately with Billy Vunipola crossing and Owen Farrell converting. However, the hosts soon levelled with Josh McNally and Tom May setting up Reynolds to finish under the posts. Strettle restored Saracens' lead when he touched down in the corner and Mako Vunipola soon added another try after Welsh gave away possession inside their 22. Elder raced through the defence to score the hosts' second try of the day, but Ashton's first of the afternoon gave Saracens a 26-17 lead at the break. Minutes after the restart Goode ran 50 metres to cross and Figallo scored their sixth try shortly after coming on as a replacement. Ashton then stole the show with three individual tries in five minutes as the Exiles faded badly in the closing stages, before Hodgson scored with minutes left to register their 10th try of the afternoon. "There's a lot of stuff to build on as the majority of our players on show today will be available next season. "For all the players involved, it's been a very tough Premiership season but it will serve them well for the future of this club." "It was a stressful day - I have never been in this position before with so many imponderables. "We scored four tries in the first half but we were pretty average so we had a big job to do in the second half." "We were keeping in touch in what was happening at Exeter and ultimately I'm thrilled to be in the play-offs." London Welsh: Jewell; Awcock, Reynolds, May, Elder; Barkley, R. Lewis; Aholelei, Britton, Gilding, McNally, Corker, West, Waters, Fonua. Replacements: Stegmann, Rowley, Trevett, Morris, Cooper, D. Browne, Thorpe, Robinson. Saracens: Goode; Ashton, Bosch, Wyles, Strettle; Farrell, de Kock; M. Vunipola, Brits, Du Plessis, Kruis, Hargreaves, Wray, Burger, B. Vunipola. Replacements: D. Taylor, Hodgson, Wigglesworth, Gill, George, Figallo, Itoje, Brown.